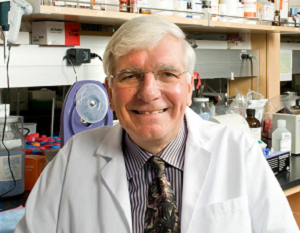 Dr. Hurley’s current research focuses on the design and development of anti-tumor agents. Throughout the past 20 years, Dr. Hurley’s laboratory has found seven different groups of compounds that may be useful in the treatment of cancer. The studies have been used in the biopharmaceutical industry to develop several drugs that were evaluated in clinical trials. Quarfloxin, for example – which was discovered and developed by Dr. Hurley – is the first-in-class G-quadruplex-interactive molecule that reached phase II clinical trials. At the NFCR Center for Targeted Cancer Therapies (2001– 2017), Co-Directors Dr. Hurley and Dr. Daniel Von Hoff worked together on a genetic structure-based approach to drug design. They combine Dr. Hurley’s medicinal chemistry research with Dr. Von Hoff’s clinical oncology program in cancer therapeutics. The team has identified, designed and synthesized multiple new compounds that selectively kill pancreatic cancer cells with mutations in the cancer-causing K-ras gene—which are present in more than 90% of pancreatic tumors. The leading compounds are being further developed for possible clinical translation. With Dr. Hurley’s expertise in G-quadruplex-interactive molecules, the team at the Center has also worked on an entirely new approach to treating cancer by developing G-quadruplex drugs that block newly-recognized genetic structures called “super enhancers.” These large clusters of DNA regulatory elements control the expression of a host of genes — including the critical cancer gene c-Myc – and offer a great opportunity for cancer disruption. This new approach may lead to great improved treatments for lung cancer- in particular small-cell type, pancreatic cancer, lymphoma, multiple myeloma, colorectal and other cancers. Laurence Hurley, Ph.D., was born in Birmingham, England and he received his Bachelor of Pharmacy from Bath University. He then received his Ph.D. from Purdue University and conducted his postdoctoral research at the University of British Columbia. He has served on the faculties at the University of Maryland, the University of Kentucky and the University of Texas at Austin. In 2000, Dr. Hurley joined the University of Arizona (UA) as the Howard J. Schaeffer Chair in Pharmaceutical Sciences and he has served as the Associate Director of the BIO5 Collaborative Research Institute and Co-Director of the Molecular Therapeutics Program at the Arizona Cancer Center as well. While at UA, he has trained more than 40 graduate and post-doctoral students. A prolific author and inventor, Dr. Hurley has published 270 peer-reviewed articles and 25 issued patents or patent applications. He has placed two novel cancer medicines into human clinical trials. Dr. Hurley is the scientific founder of Cylene Pharmaceuticals, where the Quarfloxin molecule was discovered and developed. He is also the scientific founder and CEO of TetraGene, a biotech company that focuses on targeting secondary DNA structures. He is the founder and CSO of Reglagene, the biotech company focusing on the discovery of small molecule drugs that selectively interact with quadruplexes to regulate gene expression. Additionally, Dr. Hurley has been a consultant to pharmaceutical companies throughout his career. From 1992 to 2010, Dr. Hurley was a senior editor of the Journal of Medicinal Chemistry and, from 2008 to 2012, he was a member and then chair of the National Cancer Institute’s Scientific Board of Councilors. He is the recipient of various lectureships, including the 2001 Frank Rose Memorial Lecture at the British Association for Cancer Research, the 1999 Prestige Lectureship at Bradford University, the 2007 Mary E. Kapp Lecturer in Chemistry at the Virginia Commonwealth University and the 2012 Hecht Lecturer at the University of Virginia. In 1996, he was awarded a Doctor of Science degree from his alma mater, Bath University. Dr. Hurley received the 1988 George Hitchings Award in Innovative Methods in Drug Design, the 1989 Volwiler Research Achievement Award from the American Association of Colleges of Pharmacy, the 1992 American Pharmacists Association Research Achievement Award in Medicinal Chemistry, the 1994 National Cancer Institute’s Outstanding Investigator Award, the 1994 American Chemical Society Medicinal Chemistry Award and the 2005 George and Christine Sosnovsky Award in Cancer Therapy from the Royal Society of Chemistry. In 2007, Dr. Hurley was inducted into the American Chemical Society’s Medicinal Chemistry Hall of Fame and was named Innovator of the Year by the University of Arizona. Subsequently, Dr. Hurley received the 2008 American Association of Colleges of Pharmacy’s Paul R. Dawson Biotechnology Award and the 2011 Nucleic Acids Award by the Royal Society for Chemistry. Your ticket for the: Laurence Hurley, Ph.D.